I wasn’t quite sure how to go about this (all the instructions tell you how to root it, not to undo that action), but this is what I did. 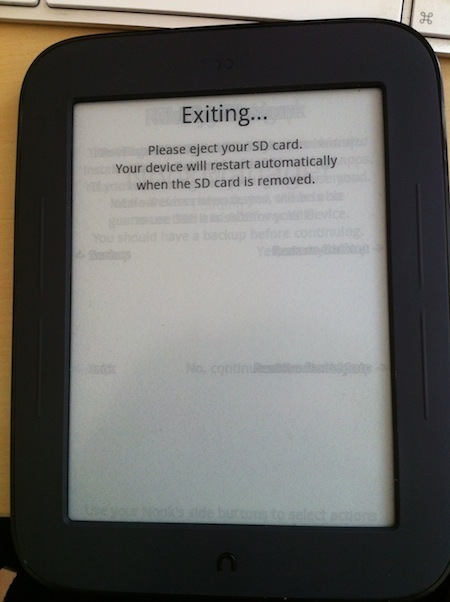 I take no responsibility for this, or what happens to your Nook as a result of you following these instructions (should you choose to do so). Please read this at your own risk. In order to unroot it like I did, you’ll need the micro SD card that *I* used for rooting it earlier. 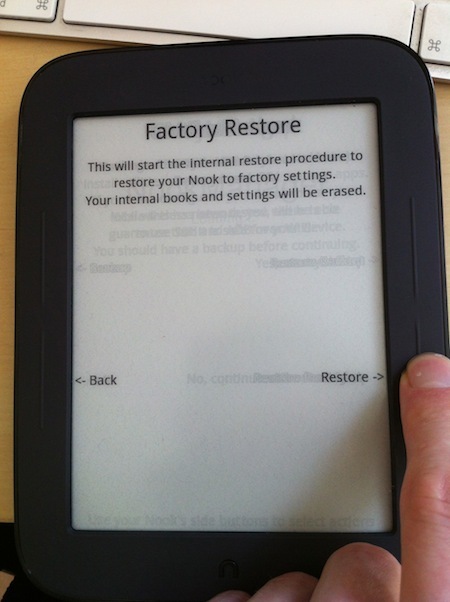 Then, insert it and restart the Nook. See the following screenshots (my finger placement will show which buttons I pressed). And then I was a bit stumped. Do I restore the backup I made when I rooted it originally, or just go for the complete factory reset. 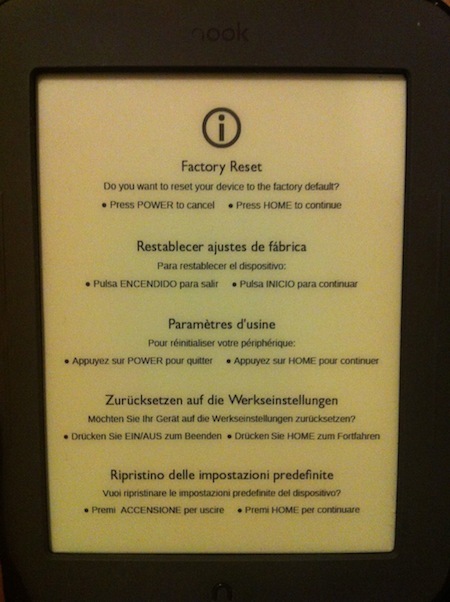 The factory reset will wipe the device, but it matters not. 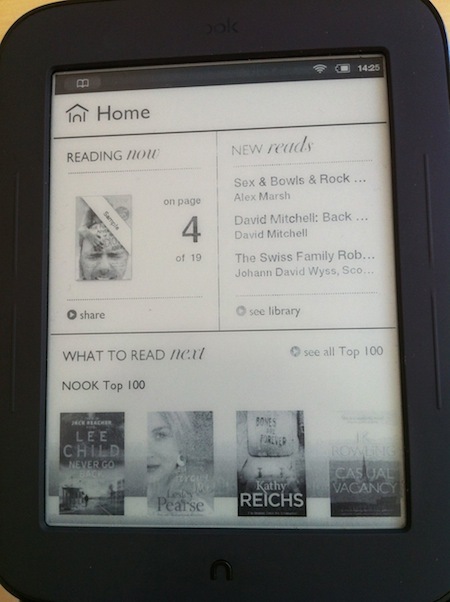 All the books I got from Nook will be synced back, all the books I got from elsewhere are stored on my Mac. What difference does it make? I went for the factory restore. Half way through the restore, the little progress bar hung at the bottom of the screen at about 50%, for what felt like a really long time. 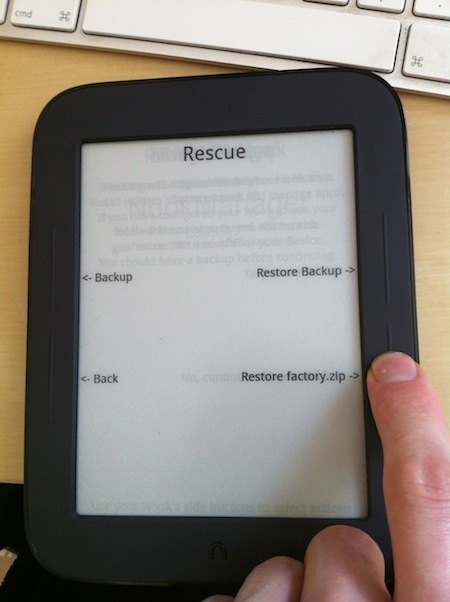 After I began to reside myself to the fact that I had broken my Nook, it continued. On the progress bar, 50-100% took seconds. Five minutes later, it looked like it was back to how it was when I received it originally. Except for that stupid bug that I mentioned on the previous post when I rooted it. The washed out text like the toner is running out on the laser printer. 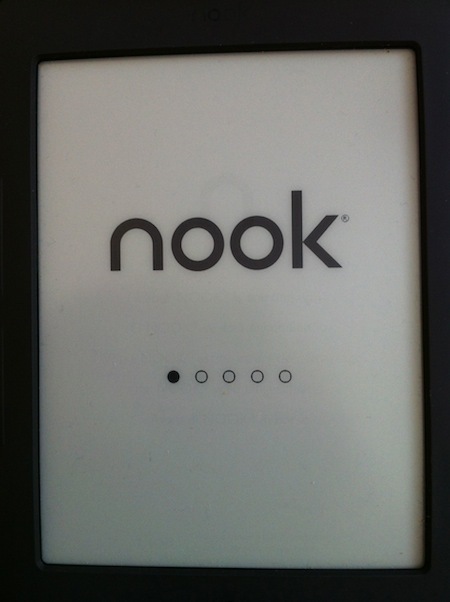 I checked in the settings (settings -> device info – about your nook), and discovered it had reverted it to software version 1.2.0. I’m pretty sure this was on 1.2.1 when I got it originally. 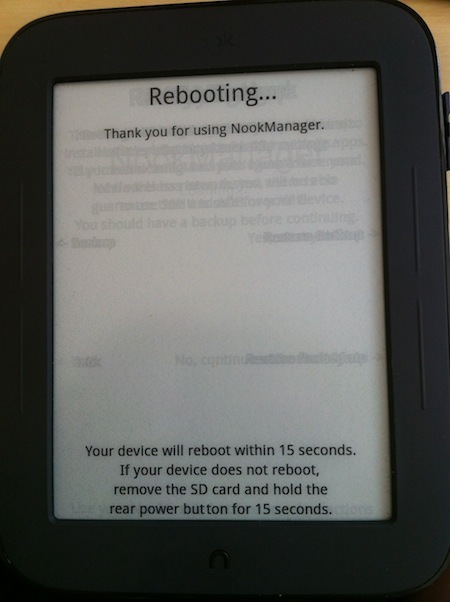 I wondered if it was a case of the NookManager software reverting it to the wrong firmware somehow, so did another factory restore but using different instructions. “Method #3. 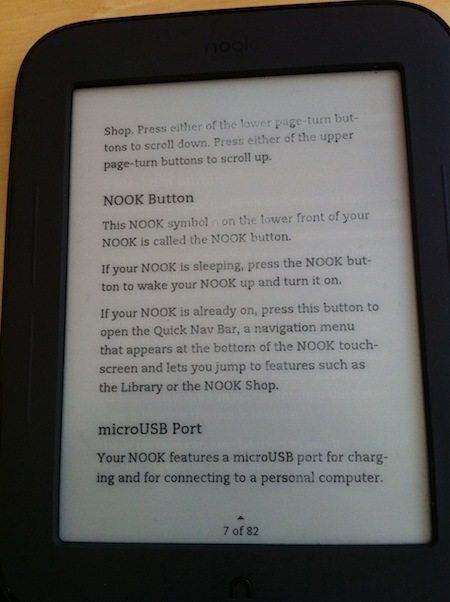 Note that this absolutely destroys your shelves, notes, and other information, and you will be asked to register your Nook with BN again. Turn off your N2E completely. Press the “n” key again. After a long wait, this loaded back up as per normal, allowed me to re-register, sync my books back, etc. However, it was still on version 1.2.0, so there was probably no need to do the second factory reset. 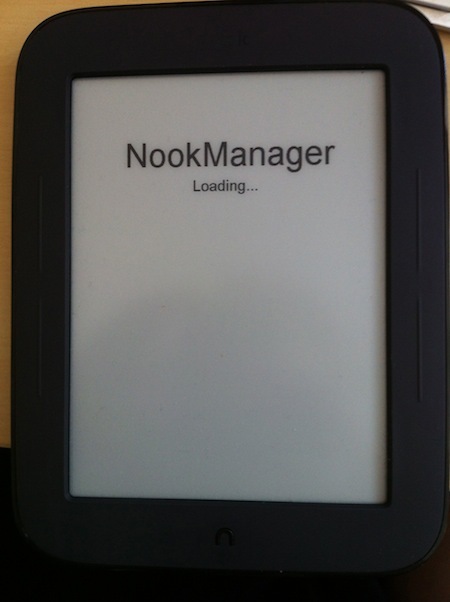 I followed the instructions on B&N’s/Nook’s website: http://www.barnesandnoble.com/u/Software-Updates-NOOK-Simple-Touch/379003175/ – only to find that it doesn’t work. 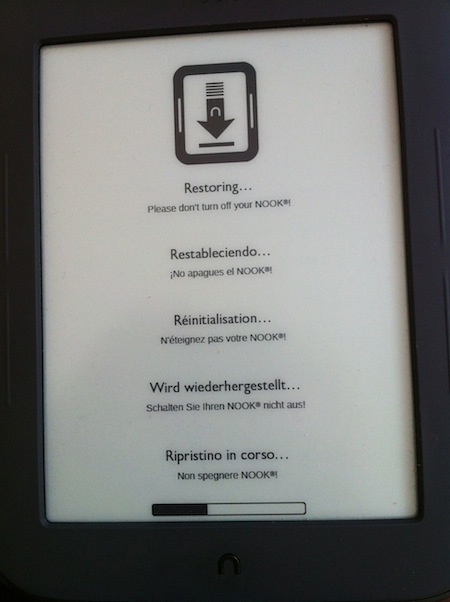 You copy the file onto the Nook, but when it goes to sleep, it just deletes the file. It doesn’t update, it stays on 1.2.0, and when you connect the cable again, the file has gone. 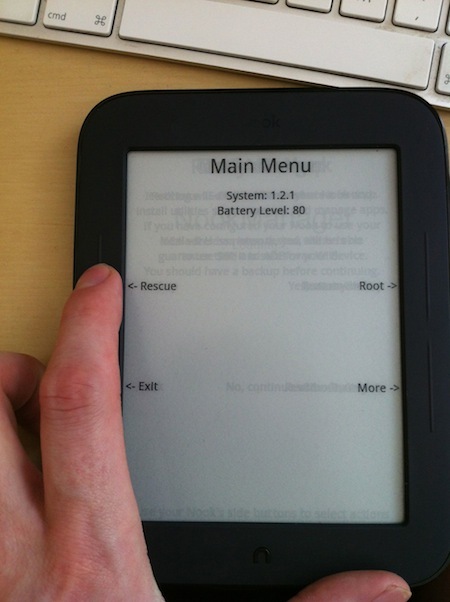 I then found this website: http://blog.empirion.co.uk/misc/updating-nook-simple-touch-nst-to-software-version-1-2-1-uk/ which explains that the B&N instructions don’t work for a UK Nook. How ridiculous. 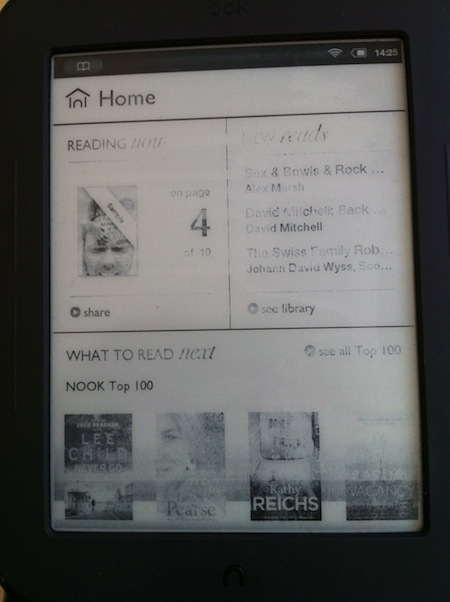 That file, with B&N’s earlier instructions, worked for me with my UK Nook, and my Nook is now back on 1.2.1. 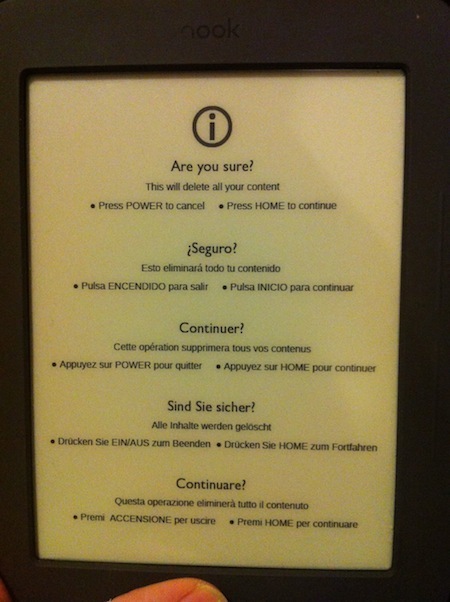 Weirdly the faded text remained until I’d flicked through a few pages, then it stopped doing it. It seems to now have gone. Maybe it’s a bug of firmware 1.2.0?